National Federation of Independent Business Optimism Index though down 0.5 points, continues to remain at high levels. 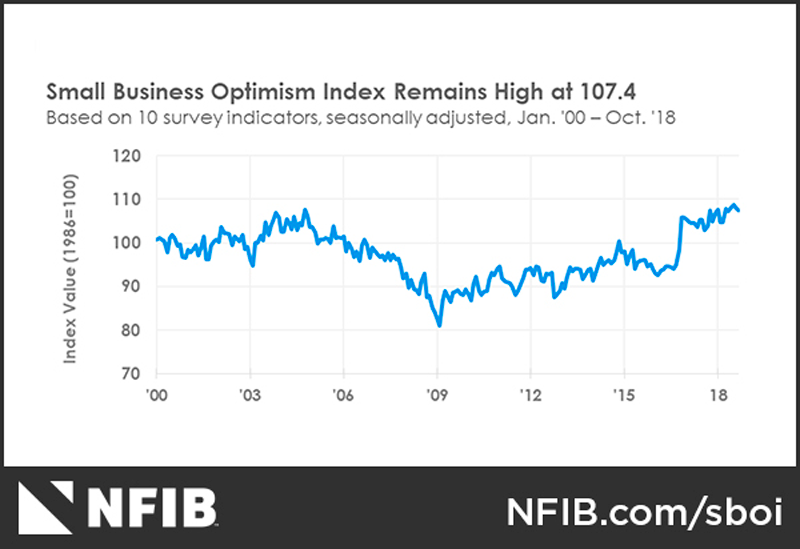 Small business optimism continued its two-year streak of record highs, according to the National Federation of Independent Business (NFIB) Small Business Optimism Index October reading of 107.4, down 0.5 points from September. Overall, small businesses continue to support the three percent-plus growth of the economy and add significant numbers of new workers to the employment pool. Owners believe the current period is a good time to expand substantially, are planning to invest in more inventory, and are reporting high sales figures.